A client recently brought in a dinning room table that originally belonged to her Great Grandmother. It had been stored in a barn until the estate was dispersed and the farm was sold. The table was in very very bad shape, but the connection to family history was to strong to pass up. So the client brought it into Studio Six for restoration. 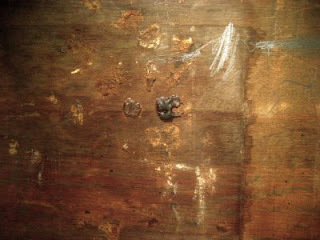 As the conservation report was being made it was noted that the underside of the table (see photo) had lots of pencil scribbles and what turned out to be numerous globs of old crusty chewing gum. After consulting with the client it was determined that these artifacts were limited to an area where her Grandfather would have set. The client decided not to remove these items because they gave a personal insight into the young life of her Grandfather.